This week we have Roland MacDonald an artist and designer who has worked on games such as Escape Room: The Game, Stop Thief and Battle Line and with companies such as Restoration Games, Fireside Games and SEGA. Hello Roland thanks for taking the time to speak to us. Firstly, could you tell us a little bit about yourself? I am from London but am now living in the Netherlands. I began my art career working in the computer games industry for five years, culminating in concept art, illustration and art direction on Shogun 2 Total War. After that I went freelance and moved to the Netherlands with my girlfriend. The life is great here. Since going freelance I have worked for pretty much every industry, from comics and books to pharmaceuticals to Google but in the last four years I have focused increasingly on art for games, digital and tabletop. I was probably always going to do something artistic. I latched on to drawing at an early age and was always making something. I think I thought I would be a graphic designer at a young age though I probably didn’t really know what that was. I studied fine art but it was in the end a conceptual art degree. I wanted to learn to paint but ended up learning about philosophy and nothing about painting. The girlfriend I moved to the Netherlands with really liked games and her father is very involved in the games scene in the Netherlands. He has over 5000 games! He helped me make some contacts and I made two games in 2012 for Cwali games. It was a pretty bad experience, largely due to communication problems, and partly due to my inexperience with how much work was involved as I created the art and all the graphic design. As it was also badly paid I gave up on board games as a viable business direction. Over the last few years though the industry has boomed and good art and graphic design is better respected and valued. Over the same period my love of board games has grown so I decided to take another shot. In 2015 I went to Essen to get meetings with publishers and I took a redesign of Cluedo as a card game to give away to them. That game was called Suspicion and was the catalyst for my new growth in the board games business. I chose Suspicion for two reasons, one, it’s a classic and two, has good characters, some items and some locations. That’s a pretty good spread of things to have in a showcase project. Also I had done a lot of work on a detective comic in the same style and knew it had a lot of potential. Of course once I started redesigning the cards of Clue I couldn’t help tinkering with the rules too. By stripping out the roll and move mechanic and by adding some event cards to increase interaction I think I ended up making some good improvements. This was also my first attempt at manufacturing a whole game which taught me a lot about the process. That experience, plus understanding more about how players interact with your art really added some great tools to my arsenal. I like to work closely with the client and understand the needs of the gameplay to come up with a great solution. A project always starts with research. First broadly, everything to do with the theme. Then narrowing down to the different elements required for the illustrations. I make a new Pinterest board for each project and look at as many different approaches and sources as possible to get away from the obvious. If you are doing a Wild West game there are a ton of reference points. Partly these cliches are helpful as it helps the player connect to the IP and understand aspects of the game easier. However, looking sideways to Pirates or Samurai might give us some new ideas for character types or looking at 18th century American landscape paintings can help us get beyond the colour palette of Spaghetti Westerns and yet still feel authentic. Ideally the project isn’t rushed, then there is time to explore the theme with a range of sketches and different design solutions. Once a basic look and feel is worked out I do sketches for all of the elements of the game. Mostly this process is digital, even the sketching. Though if the weather is nice I will use pencil and paper on a beer terrace. Sketches are loose as I like to keep some of the fun for painting. It keeps the illustrations alive and stops that part of the process being paint by numbers. Sketches are followed by rough colours studies. Once these get approved the final illustrations are done. It is Photoshop all the way. It's the fastest way to work for me and allows me to make changes both quickly and offer the publisher variations where needed. I used to do the whole sketch and scan process years ago but learning to use a Wacom tablet well enough to sketch has made that process a bit redundant. It was too slow and fussy. You were involved in the creation of Stop Thief!, so could you tell us a little bit about what that involved and what were the biggest challenges you faced? I have worked on six board game projects in the last year. Stop Thief is the latest one to get published and comes from a new company, Restoration Games. Their aim is to take old games and revamp them for the modern market. I was brought in to re-imagine the original 1979 game and modernise it with a nostalgic twist. 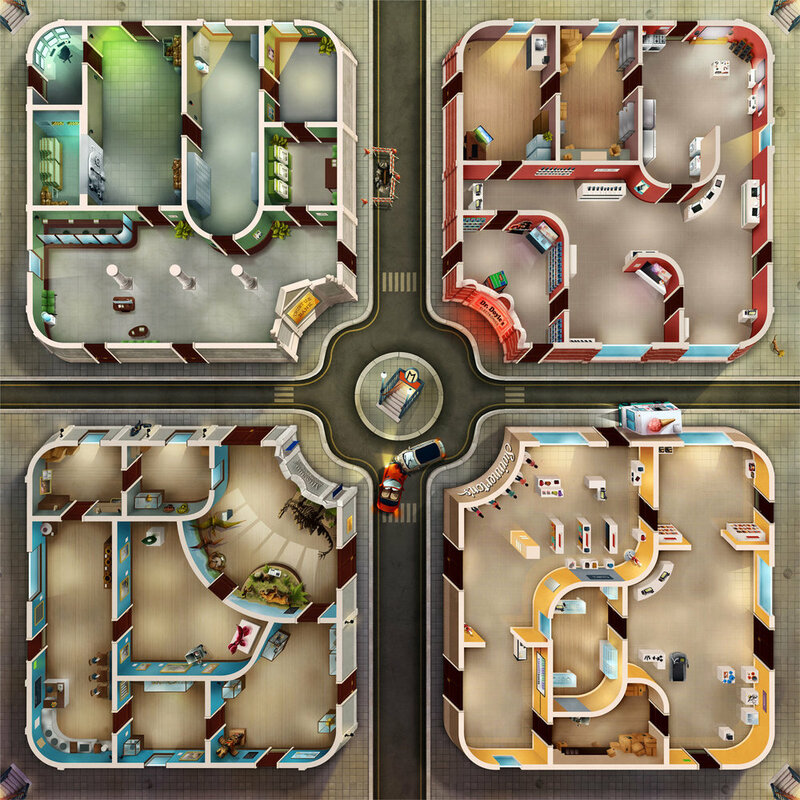 The board has a very tricky perspective and had to fit a lot of gameplay information. Handling these two things, making convincing looking locations with visual interest that wouldn’t distract from the gameplay was a fun and difficult puzzle. I worked with the design and graphics team closely to refine elements of the original layout to create an optimal solution. We were all really pleased with the final board. It is both visually rich and very functional. The project was on a tight deadline as restoration games are launching three titles at GenCon 2017 so the other challenge was the schedule. I don’t like to cut corners on the quality of the art so I worked for 32 days straight. It was tough but the outcome was really worth it. What was the inspiration or core idea that drove your work on Stop Thief!? I was chosen as the artist for Stop Thief! based on my own project Suspicion and the work I did for Escape Room: The Game. The colourful noir look of Suspicion was a great match for this game. So, that was a large part of the art direction I received, but as this is a redesign of an older game the other major influence was of course the original. That game was very much a product of its time style wise, and mechanically. It’s art was charming but a crude and simple strip comic style that now looks very dated. 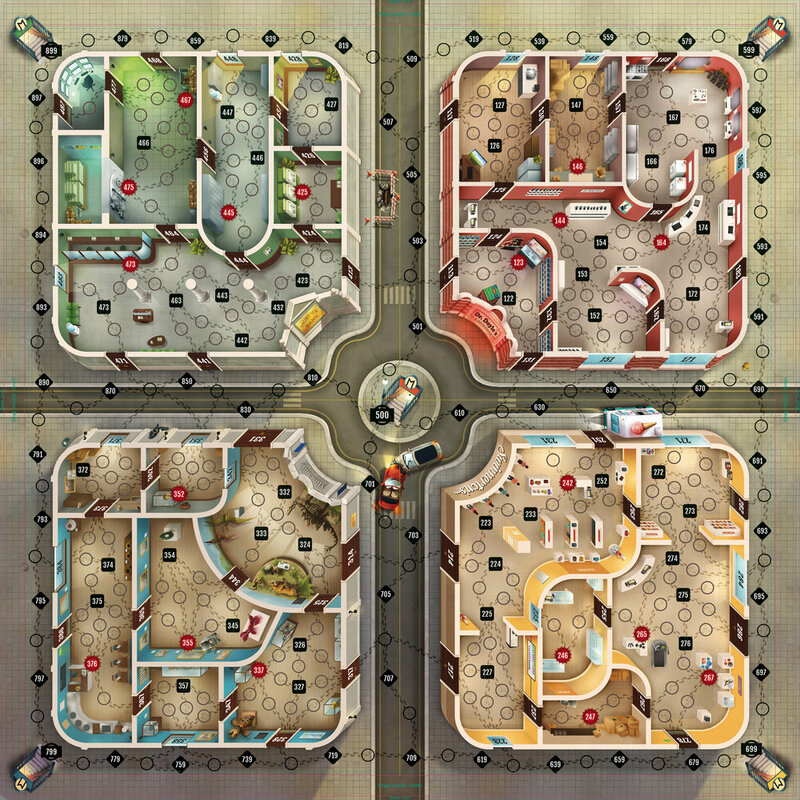 The new layout fairly closely matches the original game board and as the original game is well know by a certain generation part of the project’s appeal is the nostalgia. I don’t know that anything I am reading, watching or listening to is really seeping into my work. I do browse a lot of animation blogs and keep upto date with game and art trends. I love advertising art from the mid 20 century and that is a constant influence. Al Parker, Bernie Fuchs and early Bob Peak work are a few among some amazing talents. I could probably do with taking more time off and enjoying a good book but I am a workaholic. Do it because you love it. There are easier ways to make money. Computer games pay double what you get for a board game. If you want to learn what makes good game art and get your name out there maybe try reimagining an old game you love. It has worked twice for me and taught me a lot in the process. I recently redesigned Battle Line as a passion project and that and my Cluedo redesign have gotten me quite a few jobs and made lots of new contacts. 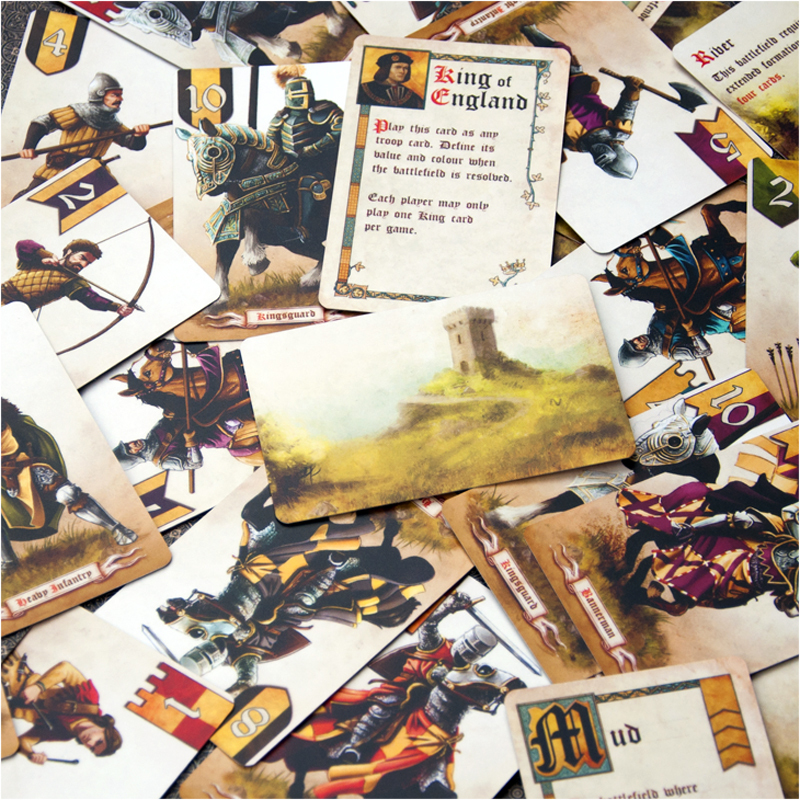 I am publishing my redesign of Battle Line as a very limited edition, 400 copies only. That is currently at the printer and available for Pre-order. The other project that is even more exciting for me is my own design, Ruthless - Legends of the Black Flag. This will be published by Essen this year! I have completely designed this Pirate themed deck builder from scratch and illustrated it too. I am very proud to say that it has found a European publisher. I will have some copies in English at Essen if you can find me but hope to find an English language publisher at Essen this year, or I might try Kickstarter. Oh and look out for Kaiju Crush later this year. I post regularly on Instagram: https://www.instagram.com/rolandtheillustrator/ both with art and stuff I like.